Our friend Rob Green has passed away at 47 years young. 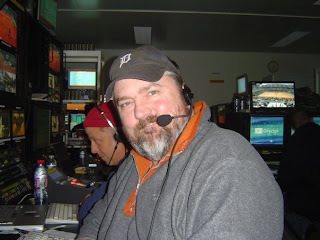 Thanks to Bob Borts for furnishing this iconic picture of Rob captaining a TV tape room with his trademark Detroit Tigers hat. I had lunch with Rob on Saturday, just about 3 hours to kickoff at Wake Forest University. He was himself, bitching about Tim McCarver's World Series commentary, recalling classic movie lines and favorite Kids in the Hall sketches. He was fired up about his Central Michigan Chippewas taking on BC later that afternoon. I even tried to rope him into working the Detroit Bowl game the day after Christmas. He asked if I was going to pay for his divorce. On this day he was also complaining of excruciating back pain, that had been with him for weeks. As a free-lancer, he was (as most of us are) afraid to go to a doctor because he was under-insured and he needed to keep working. A couple of hours later he was suffering from chest pains and EMTs came to the truck to take him to the hospital. Two days later, he had surgery in response to a brain hemorrhage. He made it through the procedure, but died during recovery. He was a cantankerous sort, just gruff enough to be beloved by so many. A true character in a business filled with them. I didn't know him as well as a lot of people I work with, but I did live in Michigan for 3 years and we crossed paths there and everywhere. I was proud to be one of his 463 Facebook friends and I will miss his frequent status updates featuring rock'n'roll song lyrics. RIP Greener. I will rock my infamous green corduroys today in your honor. Rob was a perennial member of our fantasy hockey league and even having the chance to talk with him every week online, you got a clear a sense for what a great spirit this guy had. Always fired up about the Wings and ready to let the wise-cracks fly at a moment's notice. Even in a supposedly "impersonal" online community, he will be sorely missed. "Stone", as he was called, always had something interesting to say and kept an upbeat attitude. The world could certainly use more people like him! Rest in Peace, Rob. You are missed. Just heard the news. I knew Rob through the Blue Oyster Cult internet forums and just missed catching up and meeting him in person when he came to Australia once to do the tennis. A nice guy and my thoughts are going to his family and friends. I knew him through an Apple Computer forum and also (especially) through a fantasy hockey forum. He was a thoughtful and warm presence. I will certainly miss him. I knew Rob through the Blue Oyster Cult message board. He took his moniker from a BOC song, Stone of Love. He was loved and respected by everyone in our online community and will be missed. Thanks to Versus in the first period of Tuesday's Wings/Bruins game for their memorial, including photo, to Rob. If it wasn't for this, I would have probably never known. DFTR, Rob! A friend called me to say there was a tribute to Rob Green televised on the Red Wings game last night, asked if it could be our old pal...I hoped not. I came acrosed this forum and the face in the picture confirmed it. My heart is heavy, since we have not connected since shortly after his wedding 15 or so years ago. I feel for his family. Memories of our time as Chips, the BOC/Soft White Underbelly Shows. The PASS & CBS sports gigs you got me. Most of all sharing beers and...great zany times. You will be missed, thanks for the memories. Here is the memorial commentary from Versus and ESPN. Thank you Tim G. for posting on YouTube.